Please meet Bran, named after Bran Fendigaid (the Blessed) who was the son of the Sea God Lyr, & the maternal grandson of Belenos, the Sun God, according to Celtic mythology, where he appears as a semi-humanised giant. 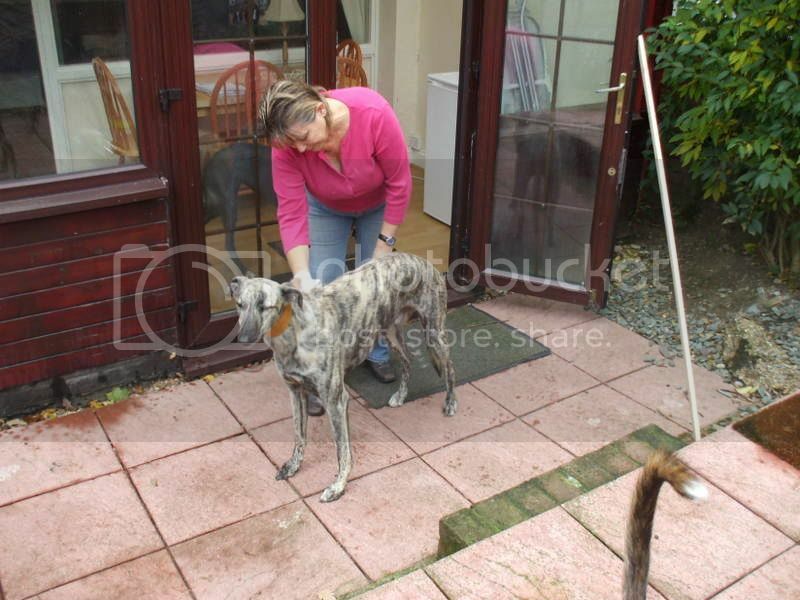 Bran is a fairly large Irish Lurcher, (though in reality not a giant), aged between 18 months & two years, who was brought into rescue as a stray. He’s a bombproof, very laid back, affectionate lad – in fact he’s a total cuddle-bunny, & he will sometimes lie on the floor to drink water from his bowl because he’s too lazy to stand up! ;D He is also an accomplished counter-surfer. 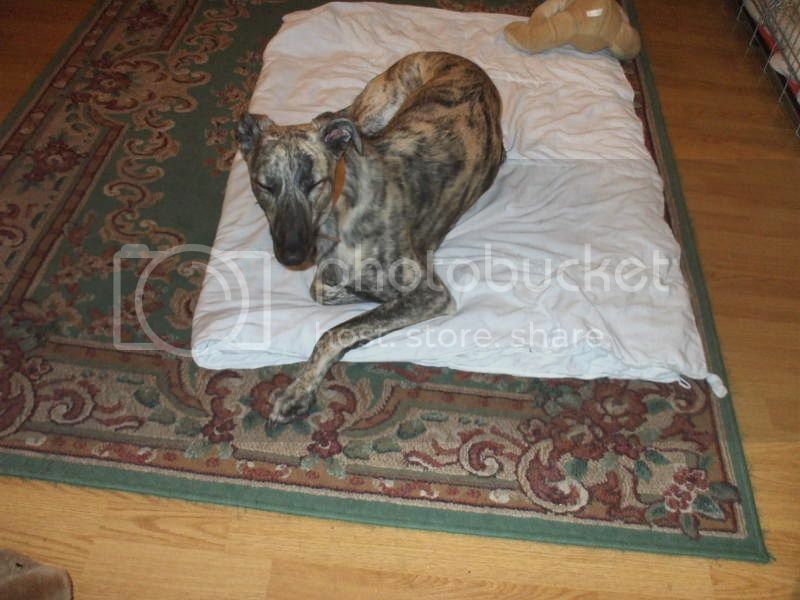 Bran has lived happily with five dogs & six cats, one of them blind. He walks well on lead, although he does tend to get excited if squirrels appear in his line of sight! 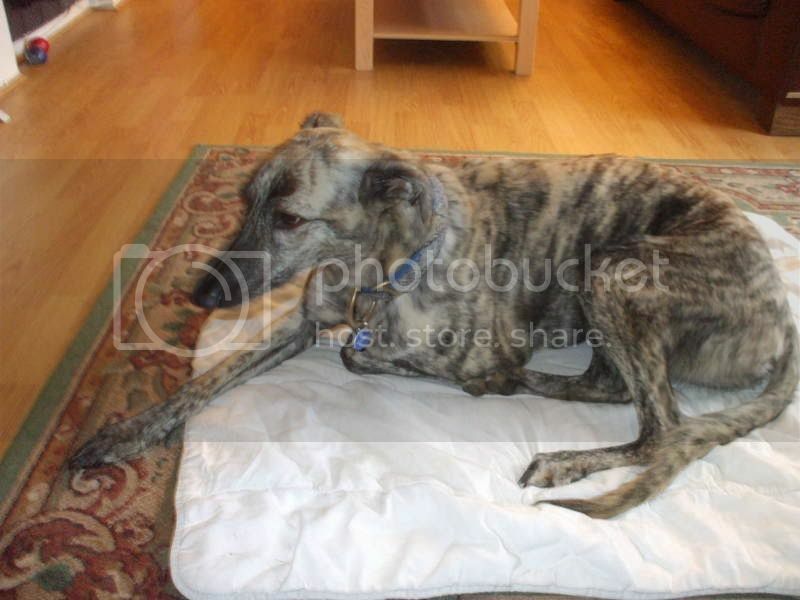 Bran is in good health & is fully vaxed, neutered, microchipped, wormed & flea treated. He is currently residing with Barney, to whom all enquiries should initially be addressed. 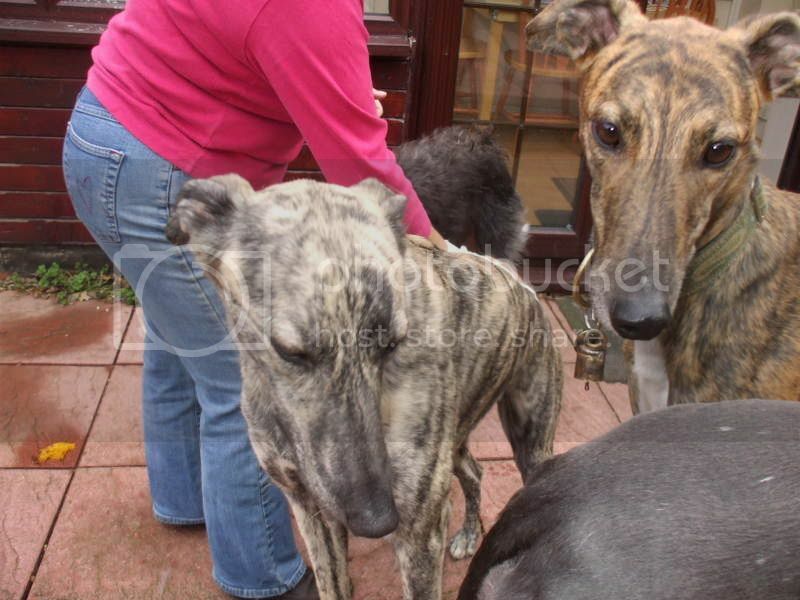 Following a successful homecheck we are waiting to learn if Bran will be having visitors this weekend. ;DBarney you are a star. Alicia too. Sorry I had to pull out of fostering Missy as Mim is unwell. How many more days left for John? Fingers crossed for his visit at the weekend. 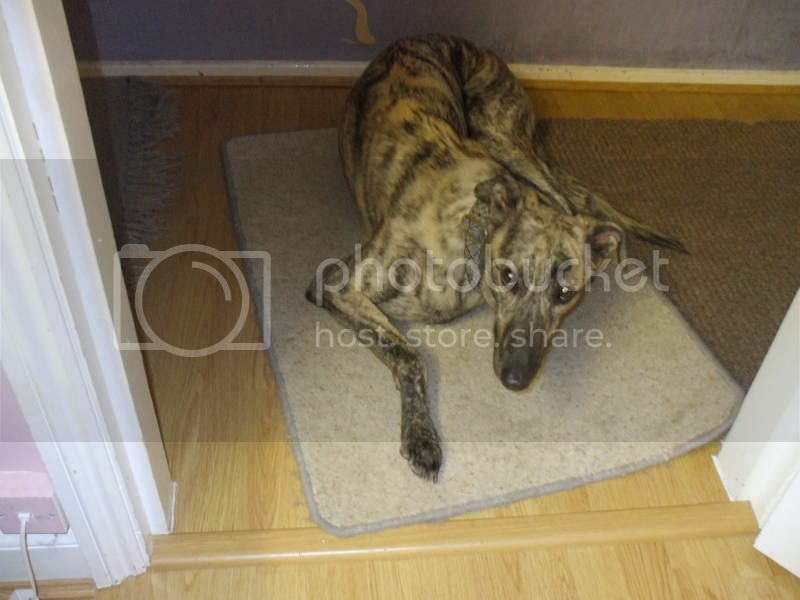 Now, call me biased, in a brindle-y direction: but that is one handsome dog! Funny you should say that Jules - but one of the first things I said to Jenny was that he's not unlike Sykes! Sykes is pretty laid back most of the time, too: I know whenever he's been on walks he's been on the demented side of wildly excited, but he does the laying-down-drinking thing, too... and eating, sometimes! 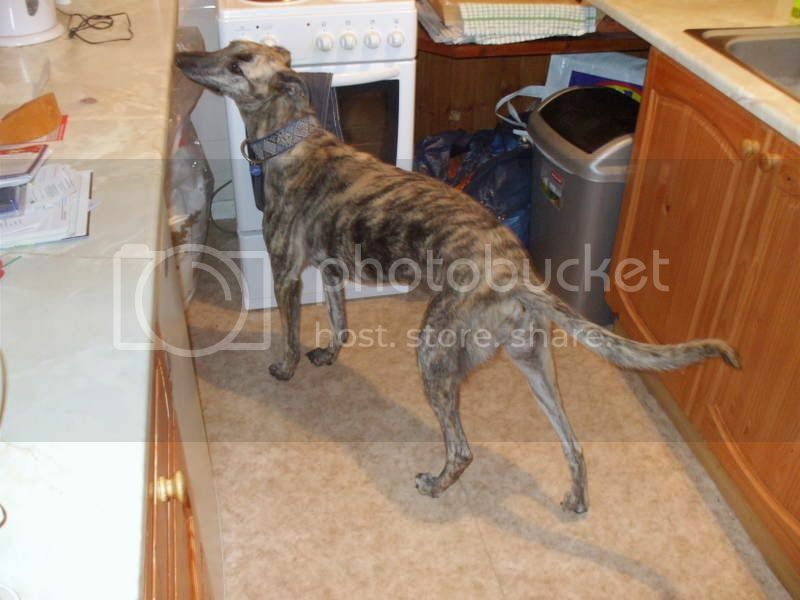 Does that mean my boy is officially a lemon brindle, then? 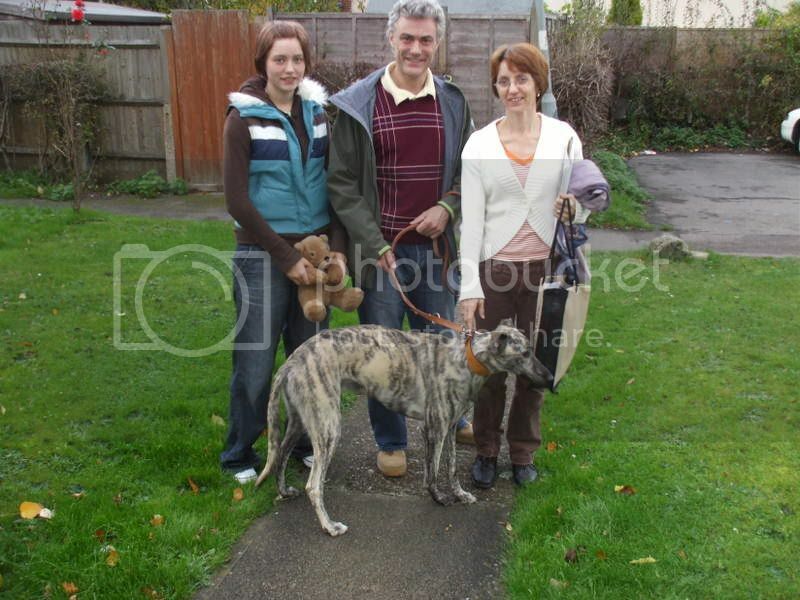 On his adoption papers it says "dark brindle" but on his vaccination book "light brindle". I had to explain to a French vet what "brindle" was - and failed. J - We're looking at 10 more days. If we can cope with the walk at Lullingstone we hope to take on another foster as we know how many are languishing in kennels. 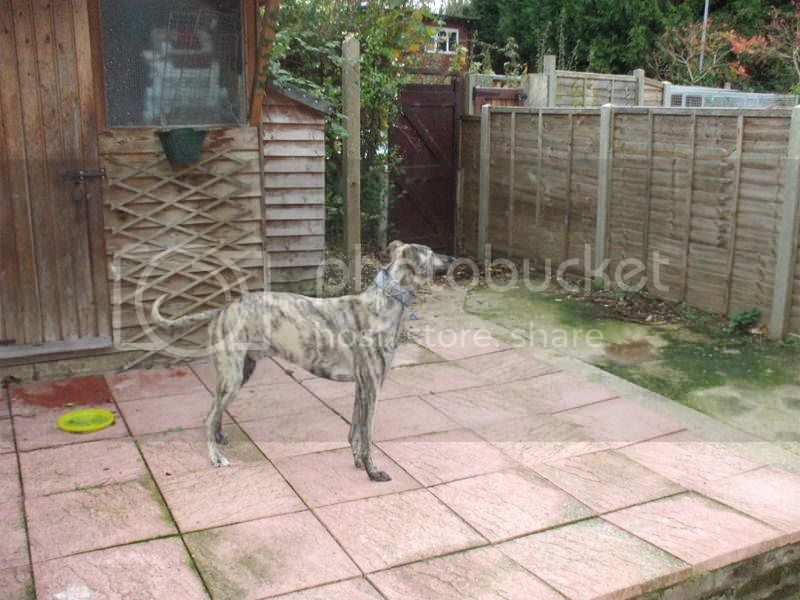 The indoors pics of Bran are misleading - the ones in the garden give a truer reflection of his actual colouring, which I'd have no hesitation in describing as light brindle. I have to declare my ignorance - before Bran arrived on the scene I'd never heard of lemon brindle! Whatever his "official" colouring, the lad now has confirmed visitors tomorrow morning! Whatever, I hope it works out for Bran! 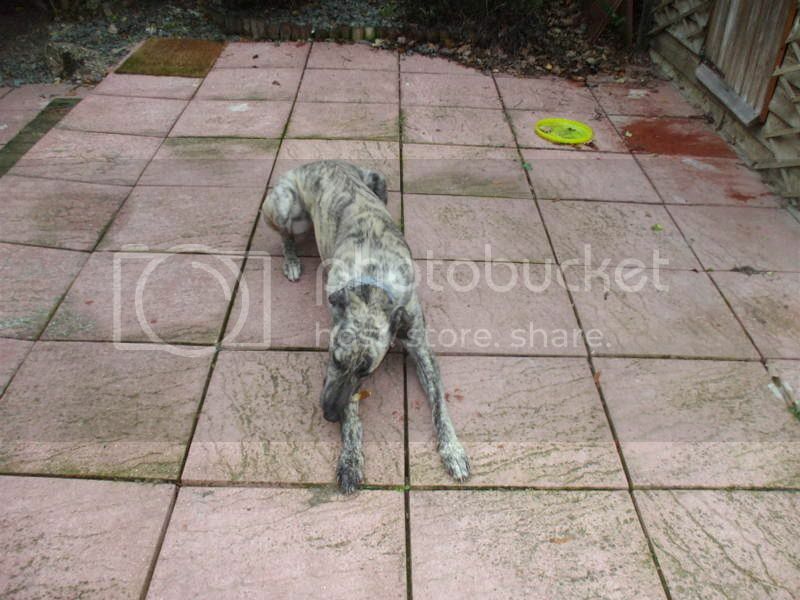 Likewise - the lad has one of the nicest temperaments I've ever encountered in any hound. Ooh, I've got to pop over and meet him before he goes B. That'll be the trips to Starbucks. I'd certainly recommend it Mummy Chook - hounds like him are few & far between. His visitors will be here about 11.00 a.m. - we'll be taking Bran out for a walk, & who knows what the future holds for him after that? I've promised that I'll have the kettle on. I measured him this evening & he stands 27" max at the shoulder, (for comparison Seamus is 33"). Bran left for his new home in Kent about 45 minutes ago, complete with his Teddy & a bag of goodies from our generous sponsors, Burns. During the visit of Ian, Lesley, & their daughter Sarah the lad was as usual a Superstar!!! (including not taking much notice of a squirrel when they took him for a walk! - that must be a first ;D ). In fact he was obviously enjoying it so much that t'others wanted to join in! 'Twas hard for me to let him go, but knowing that he will be well cared for & much loved by his new Mum Lesley, Dad Ian, & big sister Sarah did much to soften the blow. Be happy little big man - we look forward to seeing you on future SLR walks.